There seems to always be some kind of home project. Some of them are more fun than others. I loved painting our walls, but I hated not having a toilet, or shower for days because our bathroom was in disarray. The American Dream Home is something everyone fantasizes about. It feels good to get a huge project done! Whether it’s a new closet, a larger family room, or simply a place to put all your stuff, there’s always something we want to change about where we live! What if you could make your home into your Dream Home? AMERICAN DREAM BUILDERS – a new show premiering on NBC March 23 at 8/7c – and Lowe’s want to make your dream a reality. 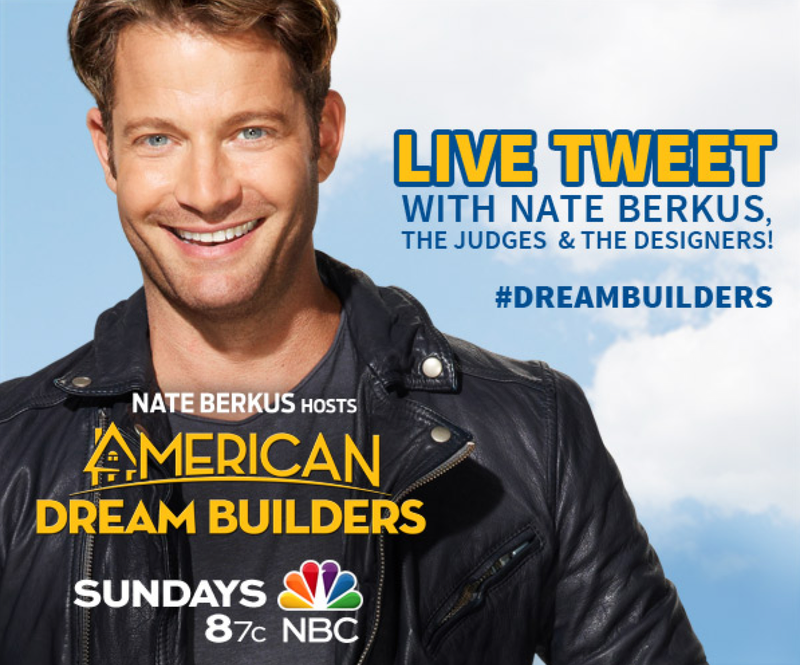 Hosted by famed interior designer and best-selling author, Nate Berkus, AMERICAN DREAM BUILDERS follows the nation’s top 12 designers and home builders as they compete to be crowned the Ultimate Dream Builder and take home a $250,000 cash prize. It’s the home competition that will change everything! From the producers of Survivor and The Bachelor, don’t miss AMERICAN DREAM BUILDERS, Sundays at 8/7c, only on NBC. Enter for a chance to win your dream renovation at www.nbc.com/lowes. And starting March 23 you will have the opportunity to earn 5 bonus entries when you “Dream It Yourself”! Upload a photo and description of a home project you are working on and EARN 5 BONUS SWEEPSTAKES ENTRIES. Finally, follow the show on Facebook and Twitter for a chance to win more prizes from American Dream Builders and Lowe’s! One of my readers is going to have the chance to win a $50 Lowes Gift Card to help your dream project come to life! This giveaway is open to the the US only. No PO Boxes please. Each household is only able to win once. If you have won the same prize on another blog, you will not be eligible to win it again. Disclaimer: The opinions on the post are my personal take on the product. This blog is a personal blog written and edited by me. I was under no obligation to review it if I so chose. Nor was I under any obligation to write a positive review. I did not get products to help with this giveaway. If I win this,I'll be buy paint. I ant to paint my daughters room! I love Nate Berkus. I am really excited for the show. Sounds like a really nice giveaway. I can use some home improvement. I would use it to help with the hardware we need for the deck we are building this summer. Great giveaway! I Can't Wait To Tune In And Watch The Show! My Dream Makeover Would Be A Huge Kitchen With Stainless Steel Appliances! My dream make over would be the redo the kitchen and laundry room. They both need a lot of improvements. I learned there are 12 designers and they only have ONE week to makeover and completely redesign a house. Cool! I would like a new kitchen island in the near future. I learned there are 12 designers to compete to be the AMERICAN DREAM BUILDER. I wish I could win Nate go come and finish my projects/re-do my kitchen!! My kitchen and basement ceiling inside. I need a new driveway too! I 'd like to repaint the bathroom. I love home design shows! Have heaps of things I want to change about our current apartment but never really got down to it. I really should..
i want to redo my kitchen. I really need to put new flooring in my kitchen. What I have now is super ugly. Thanks. I'd like to redo our sunroom. Also put on new siding! I really need to do the downstairs basement. I would love to have a real game room down there. I would like to re-work my storage closets. I'd like to have the bathroom remodeled, but since I rent it's probably not going to happen. I learned they have to renovate an entire house in just one week. I'd like to change the kitchen layout and put in new cabinets. I would love to redo my kitchen or master bathroom. At the very least, if I won, I'd paint the bathroom! I really need to repair my leaking laundry room roof. If I don't get it repaired swoon, I will end up with the ceiling collapsing from all the water. This would be so helpful once my fiance and I decide on a place. I would like to makeover the bedrooms. I would like more natural light and to paint with bright colors. I learned 12 designers are competing. I would love to renovate the kitchen and the bathrooms along with a playroom for the kids! I would like to get a new garage with shelving, a man cave, a pool a bigger back yard and wood floors. I would be concerned that they could do a good job in only one week. It seems a little like "too many cooks in the kitchen". I would love to change our home office into a butler's pantry and take out the closet near the garage entry so we could have a little mud room there instead. Then, I would like to convert our dining room into a beautiful library/office. Upstairs I would like to take the area which is master bath/closet and laudry room and redesign it into a more functional bath and closet. I would move the laundry machines over a few feet to the large hall closet. The outside could use some lovely landscaping and a gorgeous front porch. My dream home project would first of all be getting a home big enough for the six of us. Since our budget is very low, we would need to do a complete renovation which would include kitchen and bathrooms. I'd also love to make a new addition to the house in the shape of an entry way (which is very rare in the houses that we have been looking for). I would love to buy some plants and garden supplies! I go to Lowes often, it is closeby and it's a great place to shop. I'd love to have a big deck put on the back of our place. Really, I'd love a wrap-around porch but the deck out back would be just fine. I'd just like one big enough for our entire family to fit on comfortably so that we can have our BBQs here and spend time relaxing on the deck. All of our bathroom needs a serious update/remodel. We're building new things to accommodate the new baby. Mainly a twin bed for our first born. This'd be a huge help! I would love to totally redo my bathroom! I would love to redo my kitchen. Id like to add on two rooms, new aluminum siding , new windows and alot of landscaping. I need to work on the backyard. I have nothing out there but a plot of dirt. Well, there’s some weeds too. We didn’t have the money to landscape after getting our home. I’d like to fix it up so we can actually go out there and enjoy it. Lots of flowers and plants, with lots of color and sweet fragrance. A few fruit trees, and a small vegetable and herb garden. A small swimming pool and a fire pit. I also need to replace my broken washer and dryer in the laundry room and add shelves.I'd like to replace the carpet downstairs and in the upstairs hall with hardwood floors, as well as remodel the kitchen. Would love to build a pergola in our backyard. I learned from the video that they take on all kinds of houses. I would love to redo my kitchen cabinets and flooring. I learned that in AMERICAN DREAM BUILDER are compete 12 designers and they have to redo a house in one week. I would love to makeover my kitchen. I learned there are 12 designers on the show. I would love to remodel the kitchen with new cabinets, flooring and appliances. I learned a little bit about the designers.